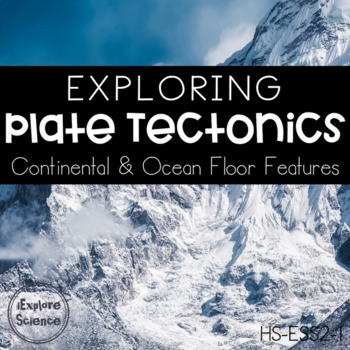 In this activity, students will investigate the locations of Earth’s continental and ocean floor features to provide evidence for the role of plate tectonics as a constructive force, shaping Earth’s surface. 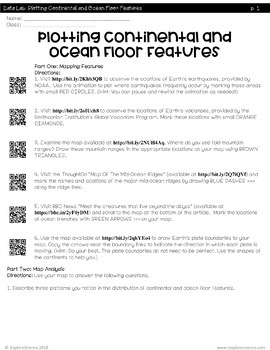 Students will visit several web resources to plot the locations of earthquakes, volcanoes, mountain ranges, ocean ridges and ocean trenches to make inferences about the connection between the movement of Earth’s plates and the surface features we can observe directly. 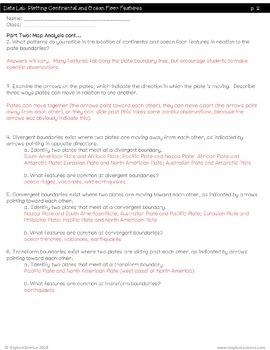 This Explore activity provides students with an opportunity to use real-world data to draw conclusions about plate tectonics, moving away from the “teaching as telling” approach and toward student “meaning-making” through observation, analysis, and discussion. This activity engages students in the Science and Engineering Practice of Analyzing and Interpreting Data and Constructing Explanations and Designing Solutions. The Crosscutting Concept focus is on Patterns, and more marginally on Cause and Effect. To learn more about transitioning your curriculum and instruction to the NGSS, visit iExploreScience and the Science Teacher Tribe. 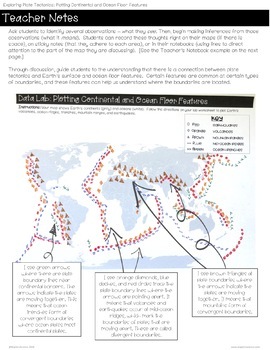 Learning Target: Students will analyze map data to describe the relationship between Earth’s internal processes (plate tectonics) and continental and ocean floor features. Success Criteria: I can analyze map data to describe the relationship between Earth’s moving plates and many continental and ocean-floor features. Students would benefit from having already addressed ESS2.A regarding the interior structure of Earth. They should already have been introduce to the theory of plate tectonics at a very basic level – specifically the idea that the Earth’s crust is broken into plates (large slabs of crustal rock) that move slowly on Earth’s surface. Because this is an Explore activity, students will likely have already participated in an Engage activity that activated prior knowledge and sparked their curiosity. Copyright © Nicole VanTassel. All pages of this product are copyrighted, and all rights are reserved by the author. You may not create anything to sell or share based on this packet. The product is created for the use of ONE teacher. Please do not share with colleagues. If they like the product, please send them to my TpT store. I appreciate your support with this request! You are permitted to share ONLY the cover image of this product on your blog or via social media as long as you link back to my product on TpT. Failure to comply is a copyright infringement and a violation of the Digital Millennium Copyright Act (DMCA). Clipart and elements found in this PDF are copyrighted and cannot be extracted and used outside of this file without permission or license. Intended for classroom and personal use ONLY.